In 1997 the world caught its first glimpse of a pre-production M-Class in Steven Spielberg’s The Lost World: Jurassic Park, the sequel to 1993's smash hit Jurassic Park. This allowed Mercedes to advertise the W163 ahead of the new model hitting the showroom that same year, and with it, the premium Mercedes SUV genre was launched. Star of the blockbuster Jeff Goldblum received a ML 320, and one of the models used in the film now resides in the Mercedes-Benz Musem in Stuttgart, Germany. Another can be found at the carmaker's international production facility factory in Alabama. When the ML went on sale in 1997 it was the largest Mercedes SUV barring the classic G-Wagon. 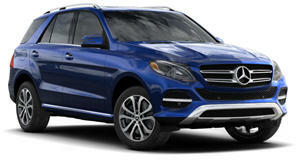 But when the GL-Class, now GLS, was added later the ML, now GLE, became the mid-sized Mercedes SUV offering. Scheduled to go on sale in the US market in January 2019, the takes over the baton from its predecessor with the big success story of two million ML and GLE sales since 1997 behind it. The outgoing W166 model was too smooth to some eyes, and Mercedes admit that it was an attempt to make its full-size SUV look more ‘friendly’ especially in the European markets. With its individual wheel arches drawn out enough to give the car a subtly muscular look with a purposeful stance, the latest car strikes a much better balance. Its fine proportions belie its actual physical size, with the optional 20-inch wheels on our test cars helping the visual balance. The new GLE also boasts the best drag coefficient in its class, its Cd of 0.29 a huge leap over the 0.32 of the outgoing model. The new GLE is larger all round than its predecessor, and with a seven-seat option even bridges the gap between the old model and the larger GLS. The 193.9-inch overall length is 4.13 inches greater than before, while width (without mirrors) has grown by 0.47 to 76.65 inches. However, thanks to a new design of exterior mirror, the GLE’s overall width with mirrors is actually reduced by 0.63 inches. The key to the new car's interior room is the 3.15-inch longer wheelbase. It is this and clever packaging that is behind the significantly roomier cabin. Kerb weight is 4,894 Ib. The only metric that has suffered from the size increase is the turning circle, which is now 8.0 inches greater. Designed to look good as well as be functional the standard side steps make entering and leaving the spacious cabin relatively easy. Once you are behind the wheel, the electrically adjustable steering column and memory seats make finding the ideal driving position pretty straightforward. The single glass panel covering the dual 12.3-inch instrument and infotainment screens is a thing of beauty, and this thin panel appears to ‘float’ away from the dashboard. Augmented software moves the MBUX interface first seen on the latest A-Class up a notch with some clever new features. This is also the first GLE with the option of a Head-Up Display. BMW introduced gesture control with its current 7-Series for actions like answering the phone or altering the cabin temperature. However, those who know this system also know that inadvertent hand movements in front of the dashboard by driver and passenger alike can have unintended consequences. An advantage of coming to the party later is learning from early adopter errors. Thus, the new Mercedes system requires specific predetermined gestures with two fingers monitored by a camera built into the roof dome light cluster. This also tracks the position and movements of your hand above the pad on the center console so that only deliberate instructions are recognized and acted upon. Meanwhile, the system also recognizes the direction a hand is coming from so that the correct seat will be chosen when driver or passenger wants to alter the massage setting or turn on the seat heating via the touchscreen. The load space is truly cavernous, with the trunk alone swallowing 22.25 cu. ft. of luggage. If you fold all the seats flat, which is easy to do thanks to remote control buttons inside the trunk area, the resulting 72.57 cu. ft. of load space is about 20% more than a large station wagon like the E-Class T-model. Climbing into the rear reveals over three feet of legroom and plenty of headroom, even for the very tall. The light and airy feel conferred by the huge optional panoramic glass room adds to the feeling of space, making travel in the rear an absolute pleasure. Although our test cars were not so equipped the GLE options list will offer a third row of seats for the very first time. Mercedes say that this seven-seat option has been designed so that adults will have enough leg and headroom to be comfortable. An easy entry feature on the rear seats will make it easy to reach the third row. Part of the comfort equation is acoustic refinement and the new GLE is around 10dB quieter in the human speech frequency range than before. This means carrying out a normal conversation at freeway speeds or listening to the outstanding optional Burmester audio system is that much more comfortable. To get a good overview of the new GLE’s capabilities we sampled the entry-level 2.0-liter, four-cylinder GLE 350, which will only be sold in the US and China. This is also the only GLE model that offers the choice of rear-wheel-drive as well as the normal 4Matic. The 3.0-liter six-cylinder GLE450 with the optional E-Active air suspension we drove later showed off the full extent of this new platform’s capabilities. Other markets will get four and six-cylinder diesel engines as well, all teamed with 4Matic. The latest turbocharged balancer shaft equipped Mercedes 2.0-liter four with balancer shafts is a relatively smooth and powerful engine. Making 258 hp from 5,800-6,100 rpm with 369 lb-ft of torque between 1,800 and 4,000 rpm it delivers adequate performance. Mercedes told us that it wasn't ready to announce the official acceleration, top speed and economy numbers for this engine as the homologation was not yet completed. The four-pot motor is moderately vocal when working hard in the intermediate gears, but otherwise the acoustics team have done a masterful job in suppressing secondary vibrations. The engine is all but inaudible at a 75 mph cruise on a light throttle, with just 1,750 rpm showing on the rev counter in the tallest of the 9G-Tronic transmission’s ratios. While the four-cylinder engine is probably just fine for folks who value fuel economy over performance, the true potential of the GLE’s sophisticated package does not become fully apparent until you drive the straight-six powered GLE 450 4Matic. The all-new 3.0-liter twin-turbocharged i6 motor introduced in the face-lifted S-Class last year benefits from a partial 48-volt electrical system with starter/generator. This engine makes 367 hp from 5,500-6,100 rpm and 369 lb-ft of torque from 1,600-4,500 rpm. Average fuel consumption according to official figures is between 25.0 and 28.3 mpg. The EQ Boost from the starter/generator provides an extra 22hp and 184.5 lb-ft of torque when you step on the throttle at low revs, with the first stage electrically driven turbocharger spinning up to boost low-end torque. By this time the big exhaust gas driven turbo is up to speed and boosting hard to provide the mid and top end power. The i6 motor is strong and smooth and perfectly suits the loping gait of the GLE 450 4Matic when equipped with the Airmatic or E-Active suspension options. The six-cylinder motor closes the sophistication loop, so the fact that its 5.7 sec 0-62 mph sprint, and electronically limited 155 mph top speed are good for a full sized SUV will be of little relevance to many prestige SUV buyers whose main priorities are image, sophistication and quality. On the basic steel suspension paired with 20-inch wheels and 275/50ZR20 rubber, the GLE ride and handling experience is good but nothing special. The compliant ride has a firm edge to it that results from the roll stiffness required for safe handling at speed. Thus, the diagonal rocking movement you experience in any tall vehicle when traversing dips in the road at low speeds is there. Things smoothen out at higher speeds, the highway ride being supple and composed in the front and satisfyingly compliant in the rear. In fact, I was not unhappy to give up the steering wheel and move aft for a while to feel the enhanced comfort engendered by the longer wheelbase. If the steel suspension is a compromise, and the Airmatic suspension a good halfway house, the subjective difference the new E-Active Body Control (E-ABC) suspension option makes to the new GLE’s ride and handling behavior is stellar. An optional addition to Airmatic, E-ABC is the only active suspension system on the market that can individually control the spring and damper forces at each individual wheel. Where air suspension smoothed out the ride of the old GLE but did not do enough to control roll in fast cornering, the E-ABC system has a truly transformational effect on the GLE’s dynamic behavior. As SUVs go, an E-ABC equipped GLE is peerless in its ability to soak up small imperfections at low speeds, while retaining iron fisted body control when you pick up the pace on a twisty road. It certainly has the edge over other full size air suspended SUVs like the Range Rover Sport, Audi Q7, and Porsche Cayenne in this respect. However, that is not the full extent of E-ABC system’s abilities. Using Road Surface Scan and the curve inclination function to seemingly work against the laws of physics, the E-ABC suspension leans into a bend to counter roll in a way that effectively removes body lean from the equation. By limiting the cornering forces acting on the cars occupants normally generated by body roll, comfort, and overall deportment all gain significantly. From a ride quality perspective the E-ABC suspension confers impressive serenity to the GLE on road surfaces of all kinds. From a handling point of view, controlling body movement and roll in this way mitigates the laws of physics that affect any tall, heavy vehicle being asked to change direction. In sum, the E-Active system adds surreal composure to your progress down any road whether straight or twisty. This is a game changing technology for both comfort and cornering performance. In an age where good cars are not exactly in short supply a vehicle capable of raising the bar to such a great extent is a rare find indeed. In base form the new Mercedes GLE is a good car, but when equipped with E-Active Body Control suspension and the six-cylinder engine it becomes a truly great one able to put clear blue sky between itself and its class rivals. When deliveries start in January 2019 the best GLE yet will undoubtedly continue to build on the success story of Mercedes' best selling mid-range SUV. , and are expected to be four to five percent more than before, but offset by the higher level of standard equipment.